Saturated with colour and visually rich with texture, Ellis’s enormous murals depict stories surrounding the North Saskatchewan River. Rowand’s Folly refers to the extravagantly large home built in the 1840’s by Hudson’s Bay Company Chief Factor John Rowand. The Brazeau/High Water refers to the Brazeau tributary, a significant fur trade travel route. Bones to the Bay refers to Rowand’s bones being shipped downriver in a keg of rum to his final resting place in Quebec. Headwater. Almost immediately after pushing off, the boulders, cut-banks, and stands of trees that line the banks of the Brazeau are moving by at an unnerving pace. After back-paddling hard over the swell of a standing wave we put in to empty the water from the canoe. I see an ammonite on the shore, washed down from a bank well above us and I think of another time – fur trade and all – when this was the means of travel. H.B.C., the Hudson Bay Company, or “Here Before Christ”. This river certainly was. John Rowand, Hudson Bay Company’s Chief Factor, had requested to be buried alongside his father in his birthplace of Quebec. He got his wish. His bones were stored in a keg of rum, shipped to York Factory and then transported to London for a memorial service organized by The Hudson Bay Company to honour his service. When the keg was opened in London, it was discovered that the rum had been replaced with water. After the service Rowan was shipped back to his final resting place in Quebec. Biography: Clay Ellis was born in Medicine Hat, Alberta, in 1955 and currently resides in Edmonton, where he has maintained a studio since 1981. Ellis has been included in numerous international exhibitions and workshops. He co-organized Triangle France, an international artists workshop held at the l’Ecole d’Art de MarseilleLuminy in France in 1995. In 2003 he was the guest artist at the Emma Lake Workshop, Saskatchewan, Canada. 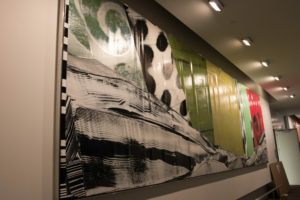 In 2006, as an artist in residence, Ellis constructed an installation in the Hopkins Center, Dartmouth College, Hanover, NH. He has lectured at numerous fine art institutions and is represented in private and public collections including the Mendel Art Gallery, the Art Gallery of Alberta, the Art Gallery of Nova Scotia, the Canada Council, the Alberta Foundation for the Arts, and Barcelona’s Museum of Contemporary Art.